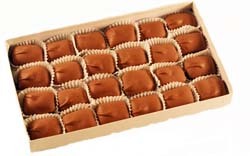 Real Pittsburghers (and those who love them) enjoy the traditional crunchy, bite-sized peanut butter bar -- especially when generously coated with Dorothy's authentic Swiss chocolates. Yummy! From MICHAEL MAIOLO of MONROEVILLE, Pennsylvania on 5/27/2016 .